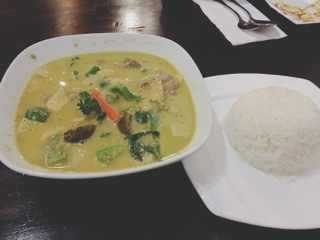 Don’t let their location at an independent gas station scare you, the Thai food at Kub Khao is legit. The store front dining room may look dingy, but the seating area at the back is colourful and cheerful, the tapestry reminiscent of the lovely woven textiles across Thailand. Accordingly, if décor is important, ask to be sat in the back. Sadly, their moo ping ($6.95) wasn’t the slightly spicy version I found at Destination Thailand, but still decent. 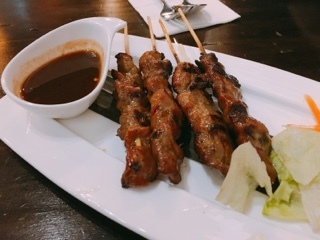 The grilled pork skewer are glazed in a sweet tangy tamarind sauce with more on the side. They’re hot and tender, served quickly so they’re almost as fresh as a street vendor handing you one fresh from the grill. 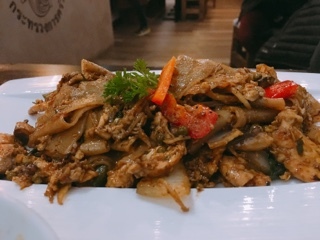 The chicken pad kee mao ($11.95) uses wide flat rice noodles stir fried with egg and vegetables. It may look like your run-of-the-mill noodles, but watch out for the whole green peppercorns hidden throughout, which adds an earthy heat to the dish (albeit more subdued that the strong black peppercorn). 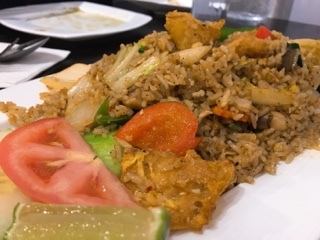 With the shrimp paste coating the rice kernels, the smoked chili fried rice ($10.95) was delicious – something I’d definitely order again. This works well as a vegetarian dish incorporating tofu puffs that add a soft crunchiness against the tender rice. Even though there was a chili on the menu, the rice wasn’t spicy, rather having a nice savoury essence. 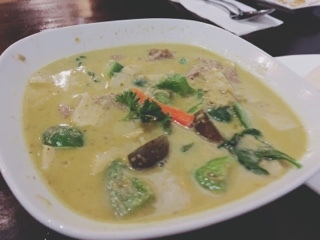 As you scoop the beef green curry ($11.95), get to the bottom of the bowl as the chopped banana peppers settles there. For the first serving, I found it was just creamy and sweet from the coconut milk – still good but far too commercial tasting. I even had to ask for hot sauce just to give it heat. However, the second serving, after reaching the chili sediments at the bottom, we felt the tinge of spice, which really makes the curry. Although the dish already comes with steamed rice you should opt for an extra order ($2), why waste any of the lovely sauce, the best part of the curry. Perhaps it was due to the holiday season, but there were only two people working at the front of the house during our week night visit. Even though service was slow (due to the sheer size of the restaurant that needs to be managed by two workers), I must commend how quickly they were operating. The mom and pop operation means stir fried dishes come out slowly, so I’d suggest getting some appetizers if you’re hungry as they arrive quicker. Moreover, the noodle and rice dishes aren’t overly large so a couple of starters amongst a table of four isn’t a lot. Just be patient. Eating at Kub Khao may not be speedy, but what you’ll get is much better than the ketchup-laced pad thai of the suburbs any day.